If you are a visitor to the sea-faring state of Maine, plan a ghost-hunting adventure and stay at one of Maine's haunted hotels. And if you are a resident of Maine, get to know your state's spookier side and embark on an exploration of the unexplainable and visit one of Maine's very own haunted hotels. One of its most haunted hotel is the Carriage House Inn in Searsport, that is resident to at least two spirits. The Carriage House Inn overlooks the shores of Penobscot Bay, and sits within walking distance from the center of the quaint village of Searsport on coastal Route 1. The Inn is surrounded by two acres of gracious, park-like grounds with ocean views. This gorgeous Victorian mansion has a wealth of stories to tell. Built in 1874 by Captain John McGilvery, a member of one of Searsport’s most prominent seafaring, shipbuilding families, its' rich history is complete with an intriguing cast of characters. The Inn was a garrison for army officers in the early 1940s, and later the retreat of impressionist painter Waldo Peirce. A well know Maine artist of international repute, Peirce was one of the most colorful personalities in American art. Lifelong friends and portrait artist of Ernest Hemingway, who allegedly frequented the Inn, Peirce found inspiration and refuge along the breathtaking shores of Penobscot Bay. It is also acquainted with ghostly stories and ghostly characters. Stories abound about the ghosts seen in the windows of this 1874 Victorian mansion. An expert on the paranormal verified there are at least two entities living here, both of whom experienced untimely deaths. 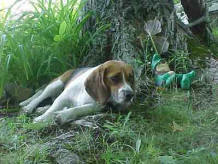 The resident beagle, Jimi (left) avoids certain rooms and the haunted staircase, the site where someone died. The sounds of soft whispers, music, knocking, the smell of cigar smoke, and a feeling that "someone walked into my room" are common discussions at the breakfast table. For those who love a good ghoul, plenty of activity is guaranteed here. 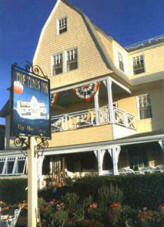 The Tides Inn By-The-Sea sits right across the street from the Goose Rocks beach of Kennebunkport. It is a picturesque, unspoiled beach of silvery white sand and home to sand dollars, least terns and harbor seals. Overlooking it is the Tides Inn By-The-Sea. The yellow turn of the century Victorian inn is also known to be haunted by the spirit of its original owner, Emma Foss. Emma Foss is the resident ghost at the inn. The Tides Inn By-The-Sea was built in 1899, and Emma commissioned John Calvin Stevens to design the inn. She apparently still has a “hands on” approach to her beloved inn. According to the current innkeepers, Emma will let them know if she approves or disapproves of any improvement made. You can read further about Emma Foss and The Tides Inn By-The-Sea in "Haunted Inns of New England," by the author Mark Jasper.